Andy is a diehard rock fan. His earliest exposure to the genre came when his sister played the Beatles for him during a tough time in his childhood. Since this year marks the 50th anniversary of the Beatles performing on the Ed Sullivan show, Andy wanted to start a project that would commemorate this anniversary, and help tie him into a group of people who also appreciate the power of rock and roll. Recently he invited the Beatles Booster Club (or affectionately known as “The BBC”) to join his project committee. The “BBC” has been a Cincinnati fixture since 1996. Linda, the head of the group said she has loved meeting other Beatles fans. Andy has joined the BBC and will be attending their future events. 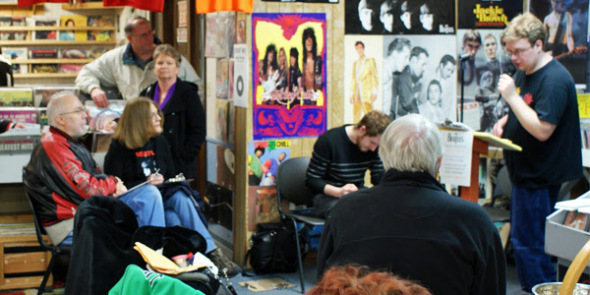 On top of that, he hosts monthly rock music trivia nights (pictured above) at Everybody’s Records in Pleasant Ridge, where he has been a crew member since 2009. Next weekend, he will also be helping run a Beatles Merchandise and Memorabilia Gala with his committee. There people can sell, trade, or display their collectibles of with other Beatles fans. The event is taking place NEXT SATURDAY April 19th, from 6-9pm at Japp’s downtown.